Posh substitute Danny Lloyd helps Jack Marriott celebrate his first goal against Charlton. Photo: Joe Dent/theposh.com. The only anti-climax from Steve Evans’ debut as Peterborough United manager yesterday (March 10) was a disappointingly low-key entrance. Some were expecting a WWE-type experience involving loud intro music, smoke, a powerfully-built figure smashing through some doors before a dramatic, threatening stomp to his place of work. Or at least the music from Jaws which would possibly intimidate opponents and officials just as much. Shyness is not a trait usually associated with this manager. Marcus Maddison celebrates his goal from the penalty spot for Posh against Charlton. Photo: Joe Dent/theposh.com. Instead Evans wasn’t even introduced to a crowd which had almost tripled in size since the last home match. The new boss emerged from the tunnel at the last minute and stood deep in the technical area. He’s not as physically imposing as his reputation suggests. He was smartly dressed and bespectacled. One has seen more imposing primary school teachers. But then the match started. Cameras trained on the Posh dugout witnessed passion, pain and fury, all in one incident when referee Brett Huxtable awarded Charlton a soft penalty early in the second half. The inevitable ‘chat’ with the match official followed, doubtless an easier conversation as Josh Magennis had sent the spot-kick hopelessly wide, before Posh went onto win rather more comfortably than they deserved, helped it has to be said by a couple of astute substitutions (that hasn’t been written much this season) and a performance full of character rather than class. “Stevie, Stevie, give us a wave,” roared part of the crowd after Jack Marriott’s late brace had delivered the flattering final scoreline. He obliged before joining the players on the pitch at the end of the game to celebrate a most crucial win. “I’ve never gone in for introductions on the pitch in my career,” Evans insisted. “Not at Leeds, not at Rotherham and not at Mansfield. I will be judged by supporters on results, not by what I say. This was a big day for me and my family, taking charge of my local club for the first time, but it was a bigger day for the club so I left the pitch delighted with the result, if not by the performance. Posh striker Jack Marriott attempts a slide tackle in the 4-1 win over Charlton. Photo: Joe Dent/theposh.com. “The atmosphere was good throughout the game though. It was very positive and the fans saw a team with a lot of desire which is important. It is all about the players, but I might just be the first person to get Marcus Maddison to run backwards so that was a positive for me! Maddison, as usual, was the centre of attention during and after the game with even Charlton’s official Twitter account making reference to the Oscars for some perceived theatrical tumbling. The trip by Charlton’s unit of a left-back Naby Sarr was as blatant a penalty as you will see though and Maddison heroically picked himself up to score from the spot to give Posh a two-goal cushion, just five minutes after Magennis had spurned the opportunity to equalise from 12 yards. As expected Evans went with a 4-4-2 formation with Maddison and Joe Ward out wide and teenager Leo da Silva Lopes recalled to play in a position he actually enjoys. 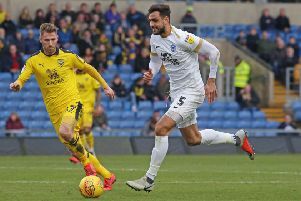 Charlton found it easy to dominate possession, but less simple to break Posh down, as much for their own poor passing tempo as for a resilient defensive display by Posh skipper Jack Baldwin and co.
Posh manager Steve Evans appeals for a decision in the game against Charlton. Photo: Joe Dent/theposh.com. Posh survived an early spill from ‘keeper Jonathan Bond, but went on to create more with less. Omar Bogle, who should be made to read and digest the offside law before he plays again, struck the post with an opportunistic strike and Baldwin headed one of Maddison’s lovely set-pieces over the bar. Evans took some credit for the training ground work which enabled left-back Andrew Hughes to pop up at the far post to open the scoring from a cracking Ward cross (the winger also played a big part in the second Posh goal) just before the break. Evans also pointed out the introduction of substitutes Danny Lloyd and Jermaine Anderson helped Posh finish strongly and he was right as both created opportunties which top scorer Jack Marriott gleefully accepted to make it 27 goals in a remarkable personal season. The third Posh goal eight minutes from time knocked the stuffing out of Charlton who had pulled a goal back with a header from their own substitute Michael Zyro 15 minutes from time, just after Tariqe Fosu-Henry had missed a six-yard sitter. Evans is in a natural habitat in front of the press which might be why he was allowed to use the phrase ‘world class’ twice after a match that was often messy without eyebrows being raised. Certainly Anderson, a young man trying to emerge from two difficult seasons, would have received a boost from hearing such a description of his goal-creating cross. The ovation Da Silva Lopes received from an appreciative crowd as he was substituted late on was another encouraging moment.